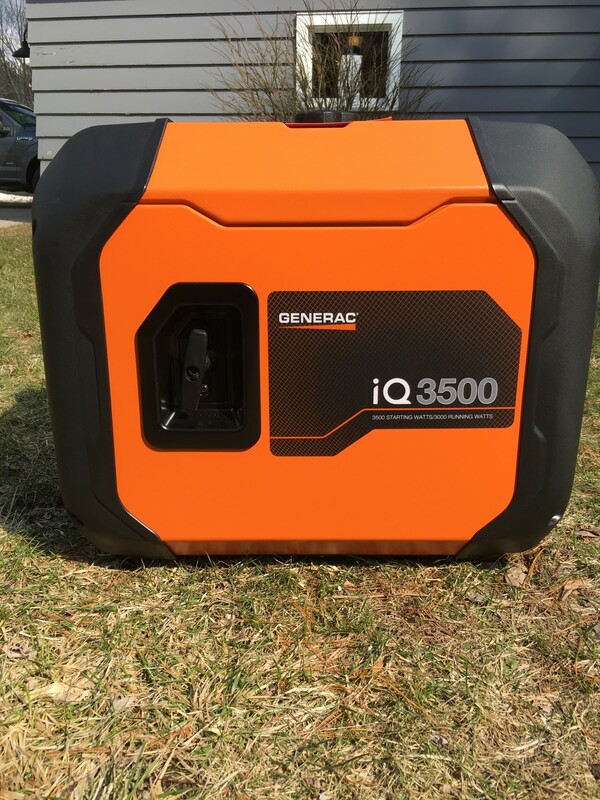 Generac has come out with a new line of portable inverter generators and they’ve asked us to review the IQ3500. The IQ3500 is marketed as a powerful 3000 watt generator with up to 3500 watts of starting power. The big draw is Generac claims it is 40% quieter than a Honda. 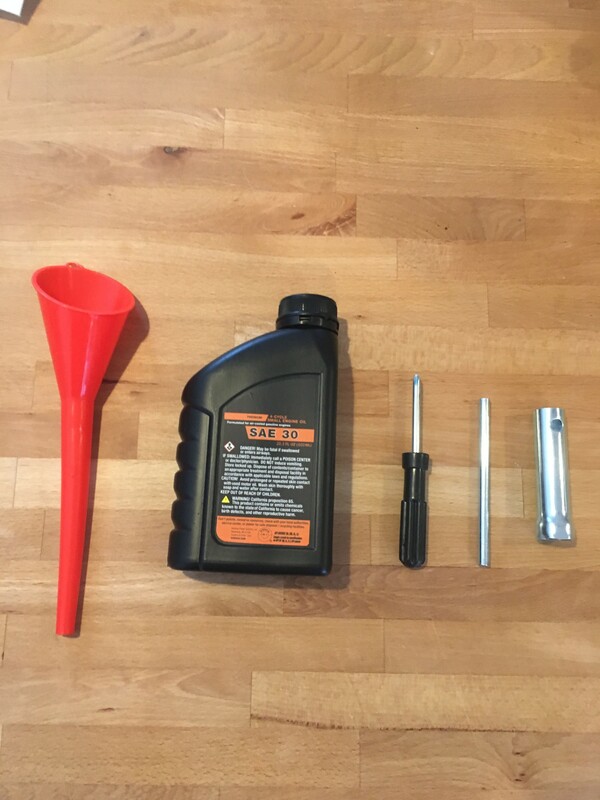 So the question is can it power your tailgate party or jobsite while being whisper quiet? Let’s find out! The first thing I noticed when unboxing the Generac IQ3500 was that the unit was fully encased in a steel housing. The overall design of this unit looks and feels rugged. It looks good too. Working on many jobsites in my former life I was used to the fully open framed generators that were so loud we spent multiple hours building an enclosure around it. Directing the persistent noise elsewhere so we wouldn’t all have headaches by the end of the day from the noise. Thinking about those days makes me happy I sit at a desk now, haha. Upon opening the metal housing I noticed it was also insulated for sounds attenuation. We’ll get to sound levels later. The IQ3500 has a 109 pound dryweight. It’s not light but not heavy when compared to others in it’s class of generators. The IQ3500 comes with two carrying handles on either side on top. I am used to generators with wheels that you can wheel around a jobsite or campsite. I’m not weak (debatable yes) but certainly do not work out. I could lift and move the unit around but any kind of long distance hauling and I would prefer a friend for some help. The size and weight make it not so easy to move around. The 2.6 gallon fuel tank gives the iq3500 a very nice 8.9 hour run time. We gave it a 6 hour run with 2 refrigerators drawing power without running out of fuel. The control panel of the IQ3500 is well laid out and easy to operate. Want to run the generator? Turn the big orange dial to run, or maybe choke then run if it hasn’t been run in awhile. Pull the start cord or just push the red start button. It’s so easy even my two year old did it, on accident. She was scared and quickly backed away. 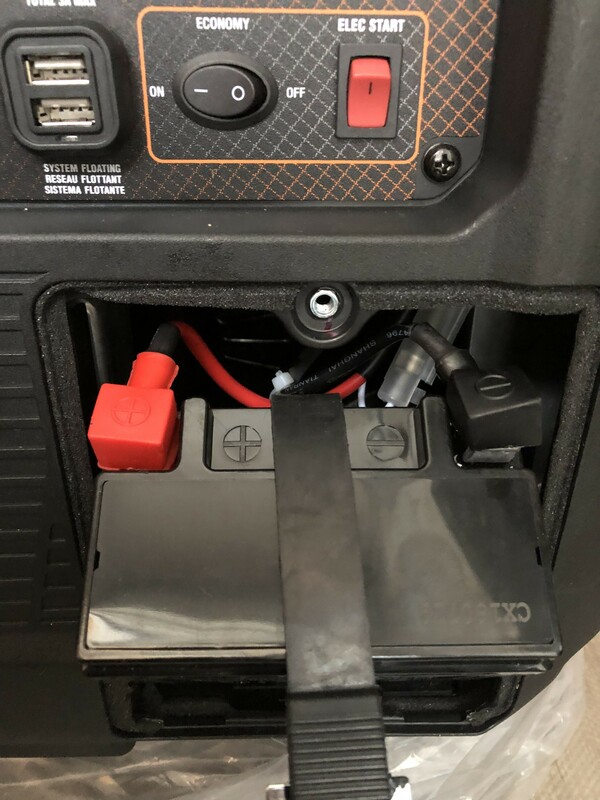 You take your eyes off of them for five seconds I tell ya… The IQ3500 has two 20 amp 5-20R outlets, 2 USB’s, 1 30 amp L5-30R outlet, and a 25 amp connection point for paralelling two Generac’s together for power outputs. The LCD display screen is nice and can scroll through wattage output, estimated runtime left, engine hour meter, and fuel level. While it is nice it has a fuel gauge but it is not easy to find or see. In looking into the Generac iq2000 that unit has a bright green dial style LED lights to display fuel level. This can easily be seen from a distance or even from inside which is super nice. I wish Generac would have made this a standard feature for the entire IQ line. The IQ3500 is pretty close to ready out of the box. Open the front access panel and connect the wiring to the battery. 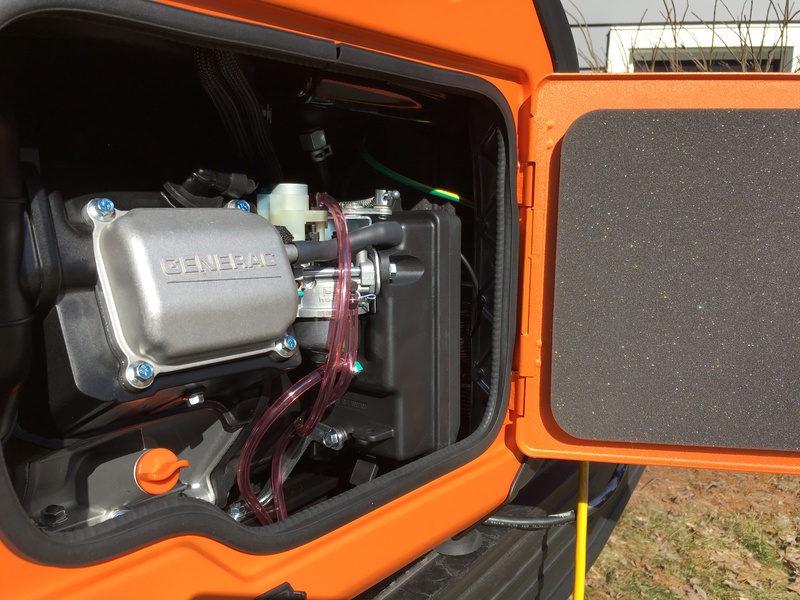 Open the side panel and fill the engine with the supplied 10W-30 oil using the supplied fill funnel. Fill it with gas and that’s about it. Fire it up! It was interesting to discover that the acceptable fuel may contain up to 10% ethanol. This means you can use regular pump gas. I expected to have to run engineered or non-ethanol fuel. So no complaints on setting this guy up. Starting the IQ3500 is easy. Two options, either pull the recoil cord which does not take a huge effort. Or push the electric start button. Pretty cool.  Now, Busted Wallet has reviewed another generator which featured a remote start. I will say that is a pretty cool feature that would be very handy if you have your IQ3500 in a longer term location. Now this is billed as being one of the quietest generators on the market. 40% quieter than a Honda in fact. So is it? The first time I pulled the starting cord I laughed. “Is it really running? !” This thing is so quiet I couldn’t get over it. You can even engage the eco-mode which ramps the engine down and it gets quieter. I was able to have a discussion with someone with this thing running right in between us without having to raise our voices. This generator is much quieter than any generator I’ve ever come across. Perfect for any campsite or tailgate for sure. This thing just purrs along and you hardly notice it. 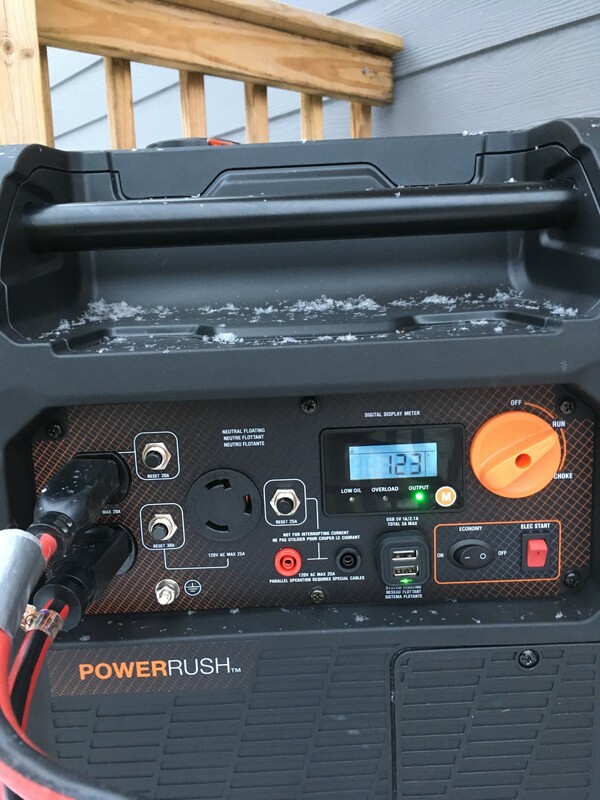 The IQ3500 has two 20 amp 5-20R outlets, 2 USB plugs, 1 30 amp L5-30R outlet, and a 25 amp connection point for paralleling two Generac’s together for power outputs. Being an inverter generator you also get nice clean power out of it. 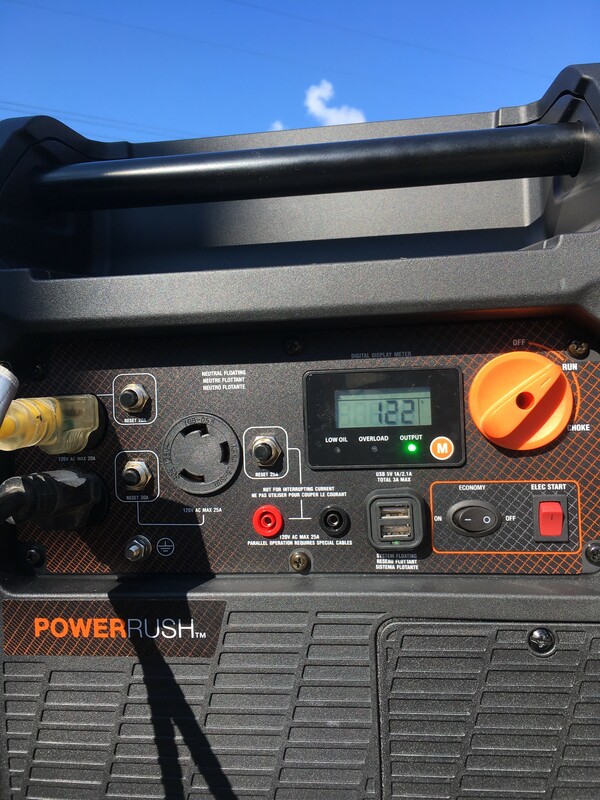 The iq3500 also has Powerrush technology which provides the unit with 50% more starting power for starting up your equipment. 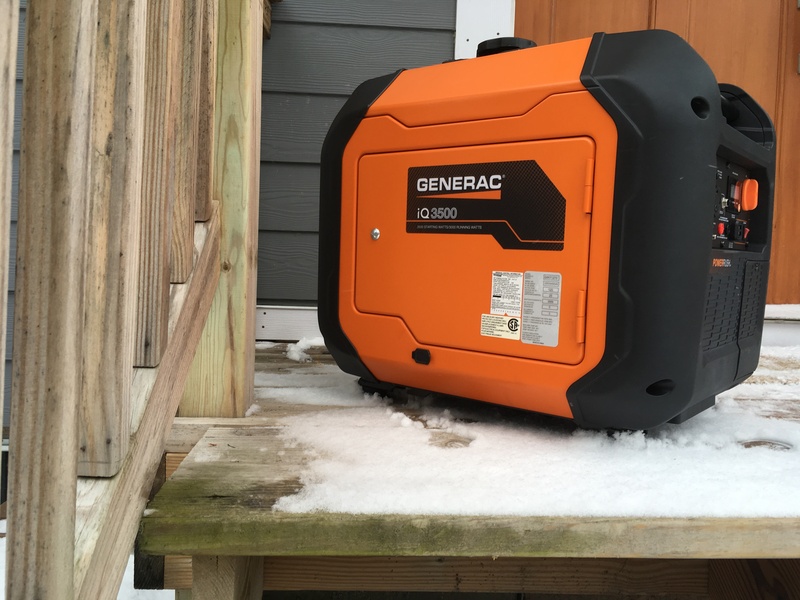 Coincidentally, as I was unboxing the IQ3500 for review we lost power in our house telling me it was meant to be Generac. I ran two refrigerator / freezers, two lamps, TV, and our cable box (the Michigan / Michigan State game was on) without issue. Not really maxing out the load but a decent initial test. I also ran two hair dryers on full heat at once which did get closer to max load. 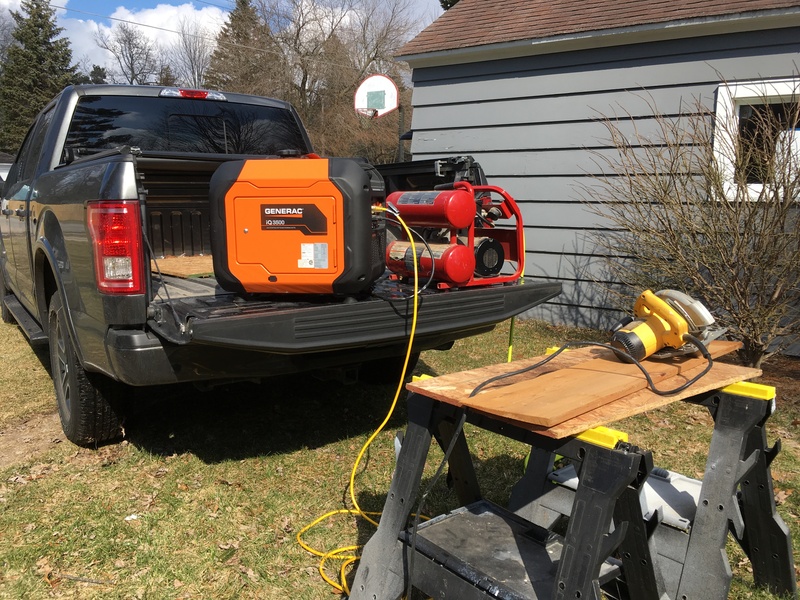 I also hooked up my 3 HP air compressor, circular saw, and 10″ miter saw simultaneously. I did trip the generator circuit once when I accidentally started the generator with the compressor plugged in and turned on. The unit handled it all very well. I would say this generator would power any typical scenario you would throw at it. This is late February in Michigan. It’s cold and we needed heat. I thought I would go down to the hardware store and get a electrical pigtail to tie the generator into our furnace. Got it all wired up, plugged it in, furnace kicked on, and boom…I’m the hero. Then the furnace shut off. After several attempts and discussing with Generac this unit is not made to power a furnace or perhaps electronic equipment. Yes, I verified that the generator had enough capacity to power the furnace. Max draw is listed on my furnace at 9.6 amps. So we spent one cold night in our house and the next at the in-laws. 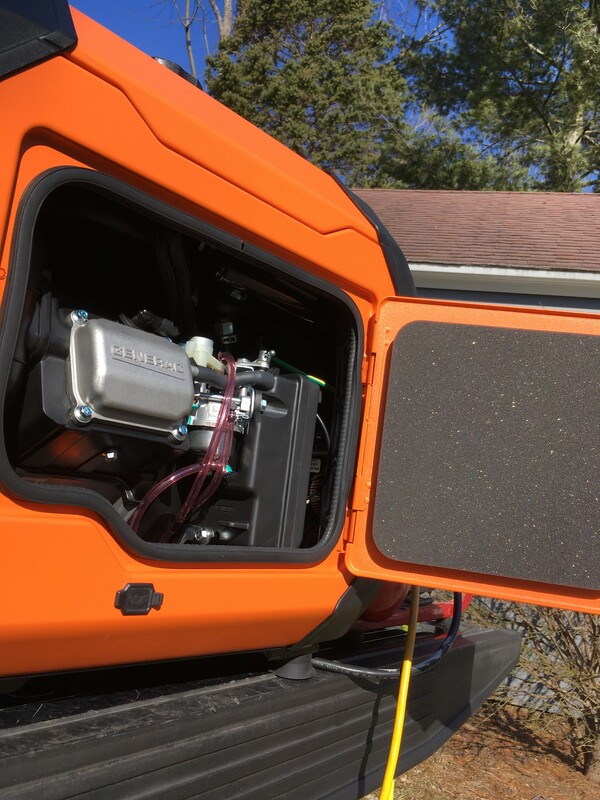 Generac they says the IQ3500 is designed more for jobsites, tailgates, and camping. I read that Generac’s whole home generators have a skewed stator which is supposed to supply a smooth output for electronic equipment use. With a list price of $1,349.00 the Generac IQ3500 is slightly higher priced than others in the wattage output. But from what I have observed this thing is super quiet, constructed very well, is a name brand backed with a nice three year warranty. A generator that is 40% quieter than the competition is worth a few more bucks to me whether you are at the jobsite, campsite, or tailgate. 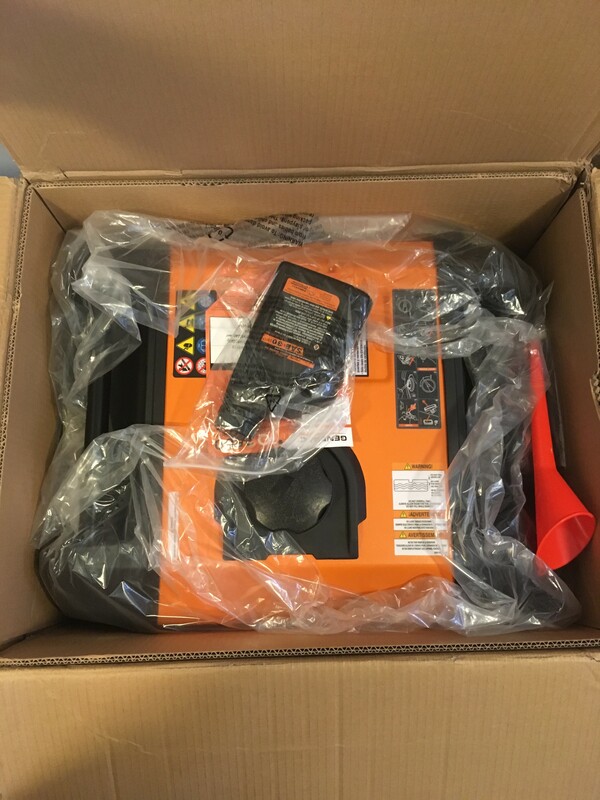 The IQ3500 is a very capable portable generator for most applications and I would recommend taking a close look when you are in the market for a portable generator. 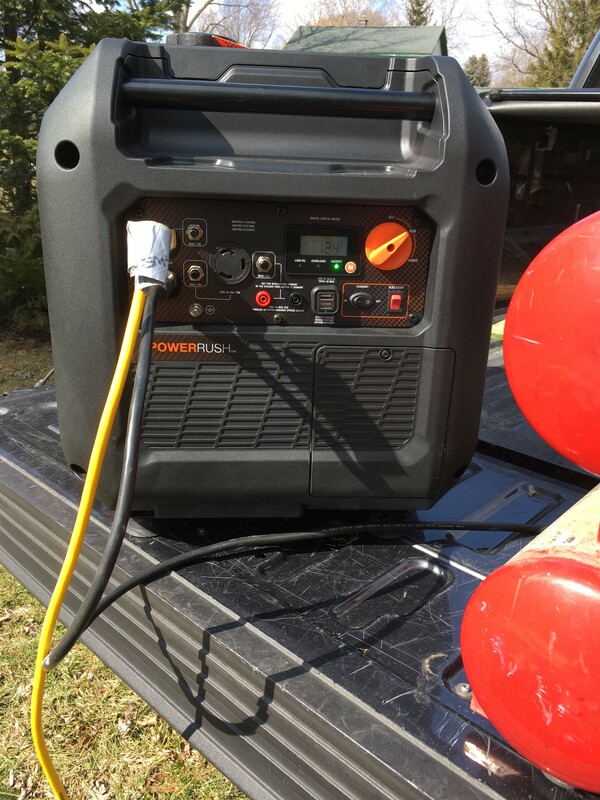 An ultra quiet and easy to use portable generator capable of handling most jobsites, campsites, and tailgates!